The U.S. biodiesel industry has grown significantly this year, but if the final 2014 RFS volume obligation for biomass-based diesel looks anything like EPA's proposal released Nov. 15, significant setbacks could be faced and thousands of jobs lost. Dozens of biodiesel stakeholders from across the country headed to Capitol Hill Tuesday to support the renewable fuel standard (RFS) and voice strong disappointment with the Obama administration's recent proposal for next year's RFS volumes. 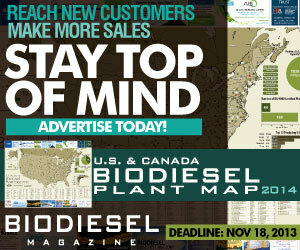 New York City-based Tri-State Biodiesel and its parent company, The Sustainable Biodiesel Company, have partnered with New Jersey-based Lard-NABF LLC to purchase and upgrade the Connecticut-based biodiesel production business, Bridgeport Biodiesel. Renewable Energy Group Inc. formally opened the latest in a series of major enhancements to its biodiesel operations Nov. 15 with a ribbon cutting at the new barge loading facility at the company's Seneca, Ill., biorefinery. On Nov. 14, Cavitation Technologies Inc. announced that its U.S. patent application, titled, "Process for Producing Biodiesel through Lower Molecular Weight Alcohol-Targeted Cavitation," has been approved for patent issuance. A bipartisan group of 32 U.S. senators from Washington to Maine sent a letter Nov. 14 asking the Obama administration to establish a biodiesel volume requirement of at least 1.7 billion gallons, consistent with this year's projected production. Boston's Parks and Recreation Department celebrated installation of new oil tanks in the Franklin Park Maintenance building with a ribbon-cutting celebration. The tank replacement was made possible by Bioheat's advertising through the EcoAd program. The Heron Lake convenience store recently held an open house and biodiesel promotion to draw attention to its biodiesel blender pumps, the first of their kind in Minnesota, and to promote the benefits of biodiesel. Blends up to B20 are available.